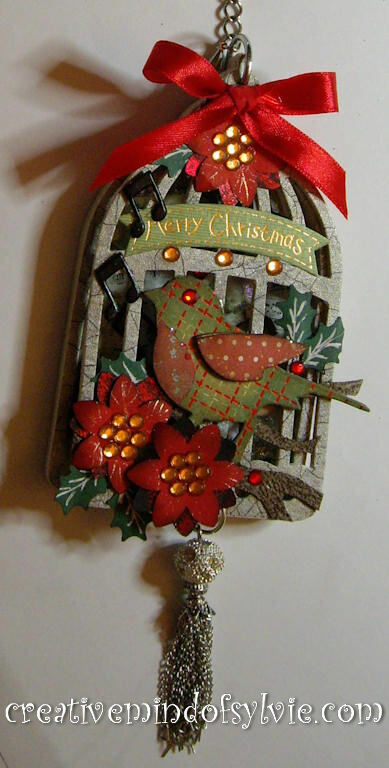 I made the inside by layering 7 birdcage dies cut from mount board on top of each other after cutting away the bars.. creating a little area to fill up with embellishments. 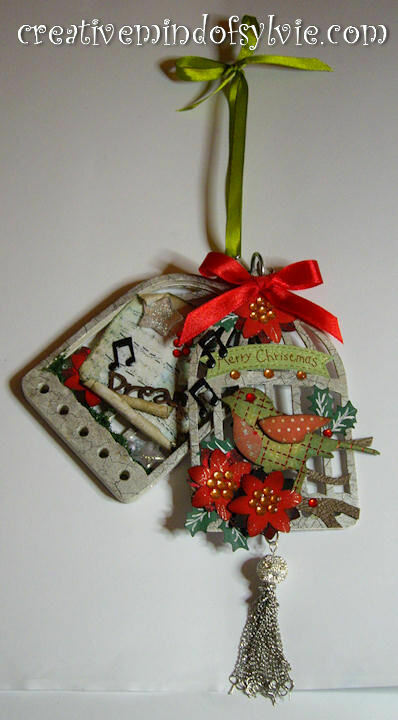 I printed tiny sheets of music and aged them with TH ink and stickles around the edges, added small amounts of green flowersoft, a few decorative brads and stars and punched holly. The crackle effect on the birdcage is die cut from wallpaper and glued on top. I added a 'D' ring to hold the two pieces together and hung a piece of scrap chain and a ribbon. The silver chain tassle is from my stash. My friend really liked this handmade gift and I have a feeling she will be getting out again for next Christmas. Oh, and another little tip.. when you buy sizzix packs of two embossing folders they are packed in a lovely acetate pillow box... great for recycling hand made gifts like this.!! What a wonderful gift! I have enjoyed visiting your blog this year - may 2011 bring you much joy. Happy New Year, no wonder your friend liked your creation it's fabulous. Wow how clever!!! Your friend is very lucky! Hi Sylvie - this is stunning! Love how you've tucked the surprise into the center. As a matter of fact, I got this very same die for Christmas. Can you believe it? You (and Paperbabe) definitely inspire me!